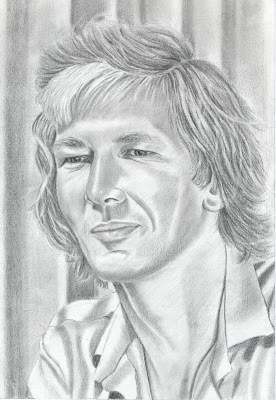 This is a pencil drawing of my Dad and It's my Dad's birthday today, so I'm blogging it as a special happy birthday post! The photograph was taken some years ago and strangely, the drawing looks far more like he does now than it does the photograph. Perhaps it's because I wasn't just copying the image in front of me, but I was also visualizing him in my head as I worked. It was quite a challenge really because when I was handed the photograph, I was told that both my Mum (who can draw very well) and my Uncle Danny (an established Artist) had attempted to draw my Dad, but neither had managed to get him quite right. Anyone who knows me well, will tell you that when I am presented with a difficult challenge, I simply have to take it on! Once I had established the position of the features and distances between, the hardest part was over. I found the eyes relatively easy - I mean, I've been looking in to them my whole life! But the mouth? Well, that really was a challenge! It's not the shape that I found difficult, but there is a particular way that he holds his mouth that I can't explain - it must be just the use of one tiny muscle and that makes all the difference to the likeness should I have got it wrong. It is surprising that by simply placing a single highlight in the wrong place, can mean the difference between a capturing a good likeness, or not. I suppose it must be because the way the light hits the face determines the shape of the skull and muscles beneath. Sandra, this is such an incredible gift and your heart just flows from this piece! The likeness is remarkable, too. Happy Birthday to your Dad :). Okay....so you look like Sandra Bullock! 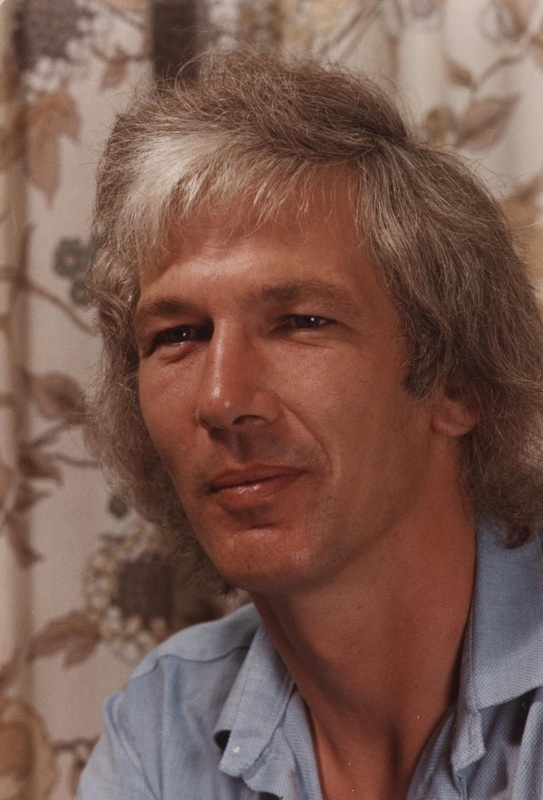 and now I see Richard Gere in your father! wow! you did such a wonderful job..I absolutely love the blending...your tonal values are perfect...you must have used a smudging stump...I love those! great job..and it is so much the mark of an artist to draw something near and dear to her heart....I do the same! thanks for sharing...and this is a comfort zone! in so many ways! Sandra, I'm blown away by this one. You did a fabulous job!! I know what you mean about the highlight. I did a painting of my nephew and just thickening one line on his eye by a mm made a huge difference. Absolutely beautiful! A really wonderful portrait! The likeness is very good! I think Anamaria is right, you do have talent for this! What a wonderful gift for your dad. You've created a very good likeness! Wish your dad a Happy Birthday for me! Great portrait! An amazing likeness! Congrats and Happy birthday to your Dad!! Its Grandad! I like it but I want it to be colourful like the picture. I think you've done an excellent job, I can also see similarities in your photo too. Happy Birthday Sandra's Dad! I don't know why you feel out of your comfort zone with this one Sandra, as it is quite a remarkable piece of work as well as a pretty good likeness too. Have to agree with CARMELINA about your dad looking like Richard Gere. If I am going to nit-pick, the trouble you are having with the mouth is that it looks a little too straight and flat. Your dad's mouth pulls in quite sharpely at the corners, with a distinct shadow at the (left to us) corner. More shading here and a fraction more curvature may help. Frank - Thank you very much! I suppose I was just nervous about drawing a face in pencil as it's not something I've ever attempted seriously. I am so glad I did though and maybe I won't avoid them from here on. Hi Sandra, congratulations! To me, you did such a wonderful job, this portrait is really fantastic. Happy birthday to your Dad. Ciao! What a fantastic portrait! You really have captured his likeness and I understand completely what you mean about how one tweak too many or a line or shading in the wrong place can make it suddenly not look like the person any more - in my case it is one or two dots in the wrong place and it's a goner! I'm sure you're dad must've been delighted with this! Sandra this is a beautiful portrait and certainly doesn't look like your first. Amazing. This has come at the right time for me because I am working on my first portrait too, so I'll be scrutinising yours for tips. If I can do half as well as you have done, I'll be very happy. Great job. Your dad looks like a marvellous person and he is one very lucky man to have this done of him. Will you please paint me. It's lovely Sandra. I'm sure your dad was over-the-moon to receive such a beautiful present. Brilliant! So like him too!! Hi Sandra. I am now on attempt number four at putting this comment on your blogg. Blogging and me don't get on so I have enlisted the help of you sister to upload this. I was determined that this comment should go on to your blogg as I cannot thank you enough for the marvellous birthday gift of my portrait. I had no idea you were working on it so it came as a complete and very pleasant surprise. It will be hung in pride of place at home if I can retrieve it from your mother. She won't let me have it until she has shown all her friends.You are certainly very talented and have come a long way since as a small girl you drew cartoon worms. So thank you once more and my thanks to those bloggy friends of yours who wished me a happy birthday. My thanks to them also for the encouragement they give you on your art. Jill - Thank you! My Dad is probably not so handsome at this moment, following all of these lovely comments, since I am sure his head must be very swollen, lol!! I can't help feeling mildly amused by the trauma you went through in trying to post your comment! It means SO much to me that you did! :0) Thank you Amanda for coming to the rescue!!! I remember the drawings you speak of - Worms and rabbits were my speciality! lol! I wonder how I'll be drawing in ten years from now...? sandra, you am stunned! you are indeed gifted! a stunning pencil portrait. i love the continuous value throughout, it gives it such an ethereal feeling! it looks as thought is was done with your heart, not a pencil at all. he must be so thrilled and proud. beautifully done!!! and oh my, what an incredibly handsome father you have! great portrait. i like the new look of your blog, too. Sandy,beautiful likeness and wonderfully drawn portrait. I think this is your thing... really. Fine job. Great lookin dad! Hi Sandra, congratulations. Great portrait! I'm happy I discovered your blog, you're really a talented artist! Beautiful drawing! Your dad must be very pleased.